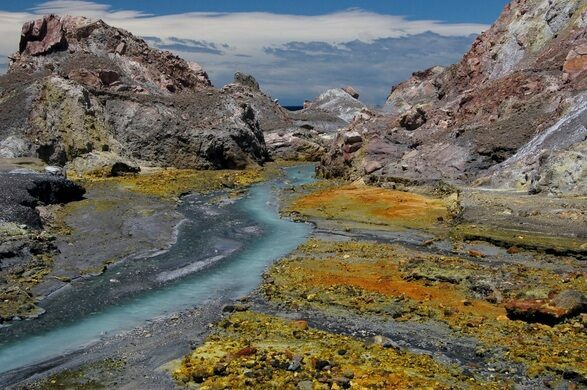 It’s called White Island, but what’s striking about New Zealand’s most active volcano is its riot of colors. Underneath the continuous plumes of white smoke there are brilliant yellows, teal blues, acid greens and rust reds. 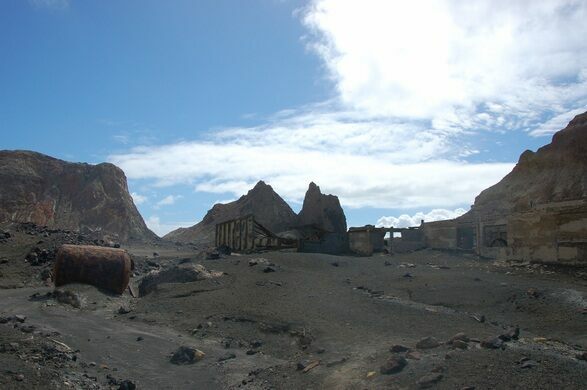 But when Captain Cook sailed by the small volcanic island in 1769 he only got close enough to see the smoke. So White Island it became. 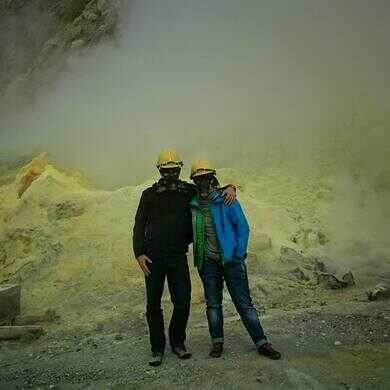 The bright yellow comes from the volcano’s natural sulfur. 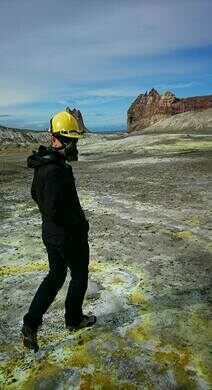 So much sulfur that there were a few attempts to mine the valuable element, which is used to make sulfuric acid, fertilizer and other commercial products. 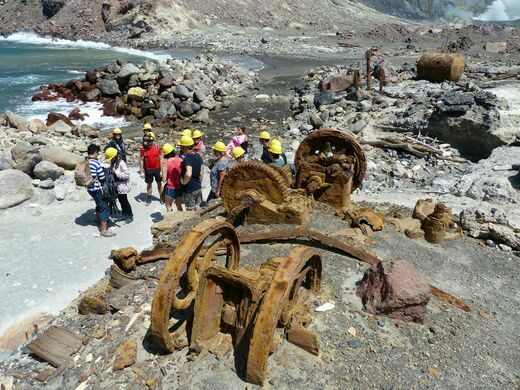 The year 1914 saw how dangerous sulfur mining on an active volcano can be, when the island’s mining camp disappeared under a landslide from a collapsed crater wall. Accounts differ, with either ten or twelve miners working that day, but whatever the number, all were swallowed up by the island. The only witness to survive the disaster was Peter the Great. Unfortunately, as the camp cat he couldn’t tell the authorities much about what happened. 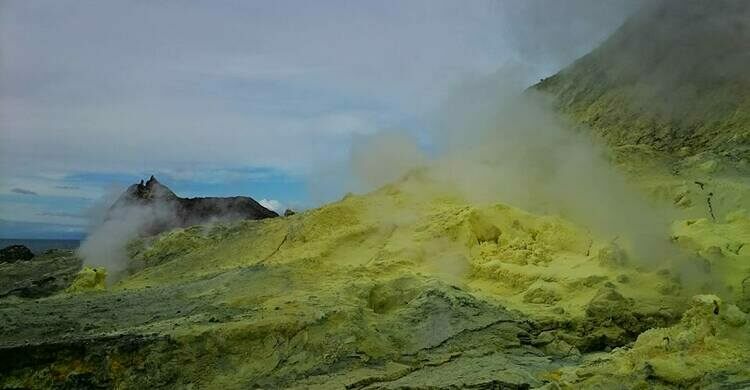 Thirty miles off the coast of the New Zealand’s North Island in the Bay of Plenty, White Island is officially called Whakaari/White Island in order to honor both the Maori and European names (although it’s mostly referred to as White Island). 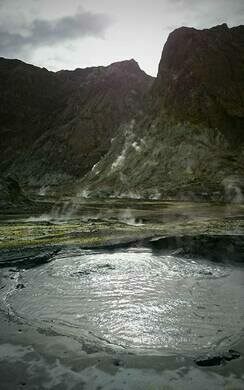 It’s small, only about a mile across with the volcano’s crater walls reaching just over a thousand feet above the Bay. Looks can be deceiving however – what you see rising out of the water is only the peak of a much bigger undersea mountain, roughly four times the size of the island. It’s still erupting regularly, even as recently as April of 2016, adding more and more to its color palette with every blast. 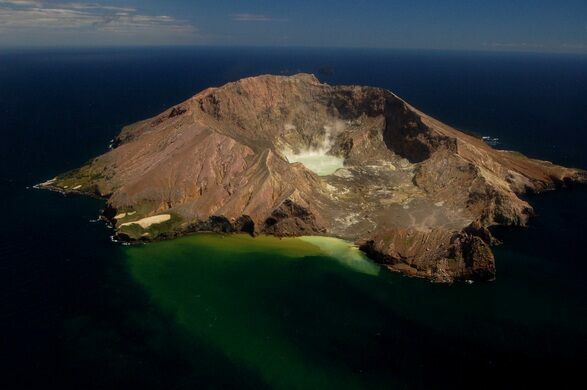 Whakaari/White Island is in the Bay of Plenty about 30 miles from shore, 140 miles east of Auckland. 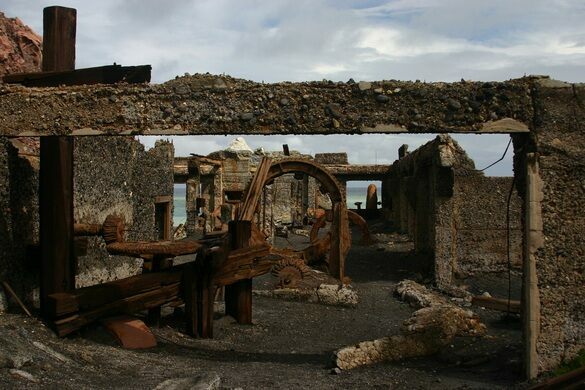 The Island is privately owned, but can be visited by guided tour, via boat or helicopter. 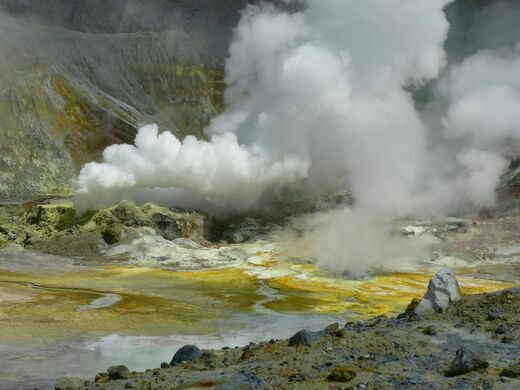 From the towns of Whakatane, Rotorua and Tauranga you can arrange a walking tour of the island, which will lead you right into the huge main crater. Hard hats and gas masks are provided for the tour.